I finished one of the placeables that I wanted to include within the new era today: Combination Chests. Players of Soul Shaker will have already encountered a version of these and so will be familiar with the concept, even though the new era version is completely revamped. For starters, NWN2 allows me to use a GUI interface rather than a conversation box for input from the player - and while programming the XML code is harder first of all, working with the input from a GUI is actually a lot easier than trying to work around a conversation with many tokens. Furthermore, the GUI makes the whole interaction much more visual and fun! I had to design the GUI background myself, and so while the artwork may not be as good as some, at least it is practical and serves well for the job. Take a look at the edited screenshot below to learn more about the way Combination Chests will be played. 1) They can try using dedicated Tumbler Picks to force the tumblers open. The chance of success is based upon the DC of the lock, the players Open Locks skill and the quality of the picks being used. There is always a minimum chance of 5% success, no matter who tries to pick the tumblers, but there is also a maximum chance of 95% for success no matter how good the PC or the picks are. Picks only have a single use like normal Thieves Tools, and the combination will lock again after the picked object is closed. 2) If the PC has the Knock spell, then they can cast it on the chest to allow anybody to try to work the tumblers that can only otherwise be worked by a PC with a high enough Open Lock skill to interact with the lock. At the top of the GUI is a standard message that the player's PC is about to interact with a Combination Lock. The digits (A) show the current tumbler setting. These change as the player interacts with either the plus or minus buttons (B) above and below these numbers. If the combination is known, the player can enter it via these buttons and then click on the "Try Combination" button (C). If it is the correct combination, the object will open. Extra information about the lock and interaction is provided (D) as the player continues to interact with the lock. An eye should be kept on the extra information section, as it gives you feedback about the lock and the person trying to interact with it. 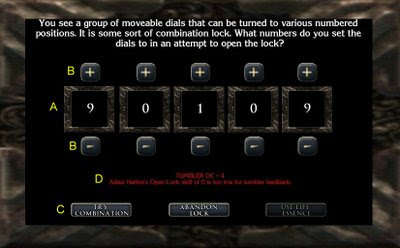 In the picture shown, the lock is said to have a Tumbler DC of 4 and that the current PC's Open Lock skill is too low to have any feedback when they interact with the lock. If the PC who interacts with the lock has an Open Lock skill equal or higher than the DC of the lock, then they will receive Tumbler Feedback with each attempt of a combination. The feedback says how many of the tumblers are correct, and so after a few attempts, the lock picker should eventually be able to ascertain the correct combination and open the lock. If the chest has had the knock spell cast on it prior to any interaction, then the working DC will be zero, which means anybody working the lock will receive the same information as a PC with an adequate Open Locks skill. NB: The knock spell only keeps the working DC to zero for a period of 15 seconds per level of the caster, and the time is constantly displayed and updated in the Information Feedback area. Therefore, time is of the essence when using the knock spell at lower levels. Once the combination has been found and the lock sprung, the knock spell ends. Along with the Try Combination button, there are also two other buttons: (1) Abandon Interaction. This abandons the current attempt to open the object without testing the current combination setting. (2) Use Life Essence. Note that this button is disabled if the PC does not carry any Life Essences (as in the picture), but if they do, the PC will have the option to use this button to force reveal a pair of tumblers. A maximum of two Life Essences can be used to reveal two pairs of digits, which are always the first four digits. Forced digits remain forced forever. I like these locks as they act as a kind of mini-game for the player who is prepared to spend just a little time trying to work out the combination if they have the skill or spell. Alternatively, there are a couple of ways to bypass the testing altogether: Either expend a couple of Life Essences to reduce the testing of four digits or acquire a number of Tumbler Picks to bypass it altogether. Of course, the PC could also just try to find the correct code in the first place. During my making of these, I came across an issue that took me a while to discover the answer to. Basically, it is to do with the Default Action Preference button for an object within its properties. When using the chest, a PC with the Open Lock skill will automatically try to lock pick it by default unless this option is changed to USED. I needed to change it to this to allow the interaction to bring up the GUI rather than the PC try to unlock it, which of course would always fail. On a different subject altogether, I am pleased to say that I have been able to acquire the services of Geoff Cordery (a.k.a. The Quillmaster), who provided some great artwork in Soul Shaker, to help out with some more artwork for another idea I have for the new era. It involves some scrolls that will work in a similar fashion to Readable Books, but with scroll artwork rather than book artwork. I hope to have something to show you in a later post. Geoff has also agreed to help out with some voice acting for me with some of my NPCs. While I may be able to pull off one or two weak personalities, Geoff has quite a flexible voice, which I hope will add to the list of characters players will meet. On the back of this, if there is anybody else who believes they could contribute towards other art work or voice acting, then please drop me a comment and we can take it from there. Can you help? That combination lock GUI looks most impressive! Man, that lockpicking GUI is an impressive idea. I took one look at the picture and was immediately excited with the possibilities. It reminds me of the mini-game in Mass Effect, but hopefully, PCs who fail to pick a lock may try again without having to reload an earlier saved game. Thanks for the compliment. :) And yes, PC's can keep trying as long as they like to spend time. At least, that how it works at the moment.